Last night, for whatever reason, he wanted me to be Jack Skellington. Who knows where he got that or why he decided to fixate on that particular character, but the fact was if we wanted him to eat I was going to have to be Jack. I must say I was rather impressed with myself. I think I did a rather serviceable Jack, right up there with my uncanny Kermit The Frog impression. In any case my Jack rendition was well received and the encours lasted through the entire evening, all the way up to bedtime. This picture was actually taken on Thanksgiving... not Halloween. Fast-forward to a quarter ’till the buttcrack of dawn this morning. Through the haze of sleep my wife and I heard our son calling out… something, we couldn’t tell what. His usual wake-up call is “Mooooommy!” This was something different. “What is he saying?” unDorkMommy said to me, more asleep than awake. I wrested myself from what was left of the dream I was having to listen. There it was again. “Oh my gosh,” I said. “It’s ‘Jack Skellington’. 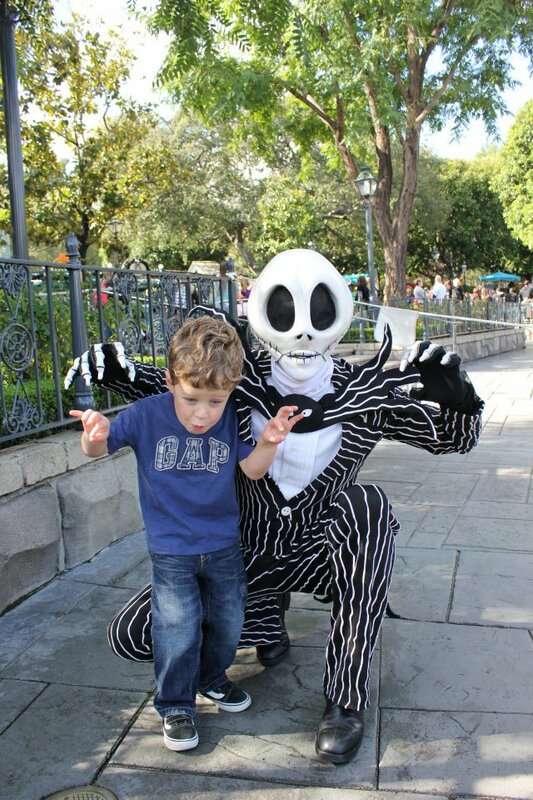 He wants me to go in there and be Jack Skellington”. Bleary-eyed and more than half asleep at six o’something in the morning (on my day off) I stumbled out of bed and felt my way through the dark to my bedroom door, on my way to placate my demanding 3-year-old son before his calls for Jack Skellington woke his moody sister too early. As I grumbled something to myself on my way out the bedroom door my wife said smugly, “It’s your fault for being the fun Daddy”. I paused in the doorframe trying to come up with a pithy response through the cobwebs. I had nothing. Her logic was rock-solid. OMG, I just sat down and watched Nightmare before Christmas again… so funny to find your post now! I wish I could live in HalloweenTown, it’s too cool!